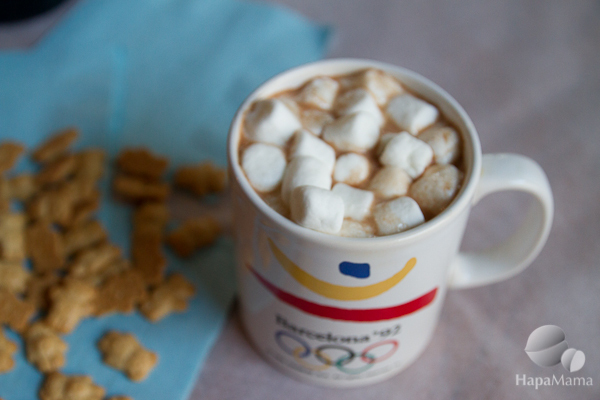 Curl up with a mug of coconut hot chocolate and watch the Winter Olympics! One of my favorite parts about watching the Winter Olympics is the addition of snowboarding as an official event. At one point in my life, I was a snowboarder. I even lived in the Sierras and worked at a ski school. But before you jump to conclusions about my half-pipe abilities, let me clarify that my employment at the ski school was to make some extra money while I also worked at a tiny little cable TV station. I suited up in the same official red and blue jacket and bibs as the instructors, but my duties at the resort did not include training people how to carve turns or pole plant. Rather, I did things such as helping little kids get their boots and gloves on, making sure they lined up for the right classes, and watching over kids who came in crying after a few hours of falling down in the snow. Once my non-skiiers and I were comfortably plunked down in front of the TV, I’d retrieve the official ski school snacks: hot chocolate and Teddy Grahams. The cocoa was just the instant kind from a machine and the grahams came in individually wrapped foil packets. But they were comfort to a cold and lonely toddler those snacks were comforting and familiar. To a starving ski school employee, the free flowing fountain of cocoa and bulk boxes of graham crackers were like manna from heaven. The staff would often joke that we needed to spike the hot chocolate with a little something extra — but to my knowledge, no one ever did. I rarely drink cocoa anymore. It’s usually far too cloying, and the heated milk does a number on my digestive system. But while curled upon the couch on a cold evening, watching Slopestyle and Boardercross, that cup of comfort hits the spot. So I’ve concocted a non-dairy hot chocolate made with coconut milk, and since I’m off the clock now — added splash of Kahlua, too. Here’s another story from a Sierra ski town, on Open Salon. Want to know how good of a skier, I really am? Check out my tale of learning how to ski. Serve it in a souvenir mug! 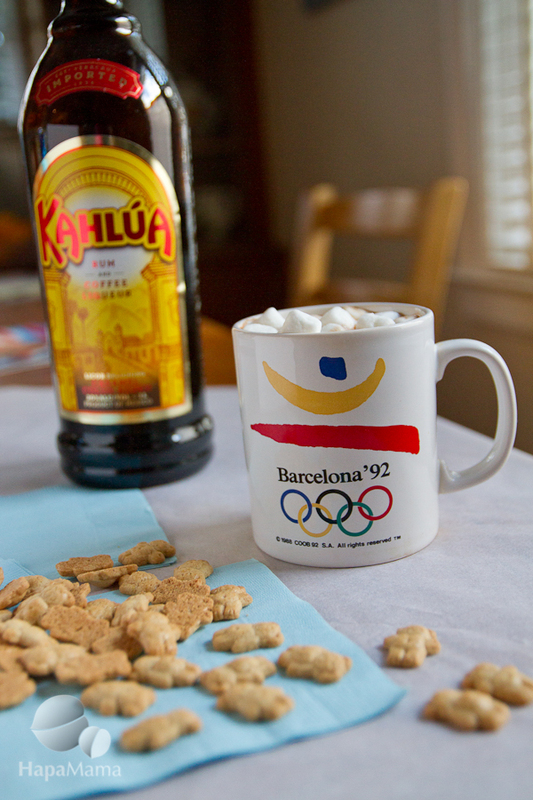 I hauled this Olympic mug home from a college backpacking trip to Europe. Add coconut milk, cocoa and sugar to a small saucepan. Warm over medium heat, stirring constantly to dissolve the cocoa and sugar and to prevent the mixture from burning or developing a film. Pour into a mug, add a dash of Kahlua, and top with marshmallows. This post is part of Let’s Lunch, a virtual potluck with food bloggers from around the globe. For more stories and recipes inspired by the Winter Olympics, follow the #LetsLunch hashtag on Twitter. I am pretty sure I lack fundamentally qualities necessary to a snowboarder (like a sense of balance), but it’s crazy fun to watch. I commend you on the addition of coconut milk to hot chocolate; I’m not sure I’ve ever had a single dish made with coconut milk I didn’t like! The snowboard slope looks so dangeorus, but it’s so thrilling to watch! Sweet! 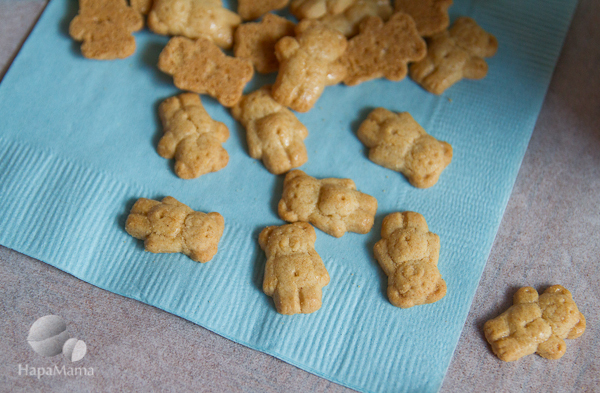 I was wondering about those teddy grahams yesterday. Bears in the Russian woods? Graham crackers as an old-school health food? Team USA athletes taking a nap? But no: it’s COCOA from heaven! I think this will do very nicely for Opening Ceremony accompaniments. No TG’s, but I think I can skip those, since I am over-age. I love your mug, but I love what’s in it even more. The addition of coconut milk combined with the marshmallows just made this a winner for me. It was fun doing Let’s Lunch with you. Thanks for sharing this coconut chocolate kahlua, Grace! Coconut hot cocoa. This is sliced bread-level genius. I agree with you on cloying hot chocolates. I’ll give your coconut milk version a try this winter! Love your ski lodge stories!